Ahmadinejad has warning for U.S.
Iranian President Mahmoud Ahmadinejad made his comments in a televised news conference Tuesday. Tehran, Iran (CNN) - Iranian President Mahmoud Ahmadinejad warned the United States and other nations Tuesday not to impose tougher sanctions in reaction to the Islamic country's nuclear ambitions. Iran already faces U.N. sanctions and the five permanent Security Council members - the United States, Britain, Russia, China and France, all of which have veto power - have been engaged along with Germany in discussions about possible further measures. "It's high time for some people to open their eyes and adapt themselves to real changes that are under way," Ahmadinejad said at a news conference in Tehran. Asked specifically about the threat of tougher sanctions, the Iranian president said, "We prefer that they move in the spirit of cooperation. It won't put us in trouble. They themselves will get into trouble." 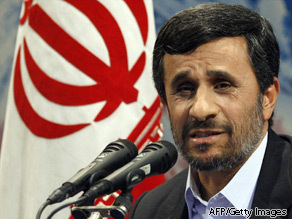 Ahmadinejad also seemed to threaten unspecified retaliation, saying Iran won't act like it has in the past. Ahmadinejad's comments came one day after U.S. Secretary of State Hillary Clinton and Saudi Arabian Foreign Minister Saud al-Faisal expressed concern over Iran's nuclear program. 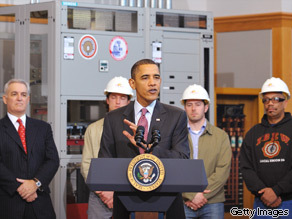 President Obama speaks during a visit to an IBEW training facility in Lanham, Maryland, on Tuesday. Washington (CNN) - President Obama announced $8.3 billion in loan guarantees Tuesday for two nuclear reactors to be built in Burke County, Georgia. No new nuclear power plants have been built in the United States in three decades. The new reactors are to be part of an expansion of an existing nuclear facility near Augusta, Georgia, operated by Atlanta-based Southern Co. The loan guarantees will help create 3,500 on-site construction jobs and 850 permanent operations jobs, administration officials claimed. The reactors will help provide power to over 550,000 homes and 1.4 million people, it said. "This is only the beginning," Obama said during a visit to an International Brotherhood of Electrical Workers training facility in Lanham, Maryland. "We'll continue to provide financing for clean energy projects ... across America." When is your chubby baby too chubby? A new study published in the journal Clinical Pediatrics has concluded that "the critical period for preventing childhood obesity...is during the first two years of a child's life and for many by three months of age." It's the first study to identify a so-called "tipping point" in a child's development of obesity. This new finding comes as first lady Michelle Obama is targeting childhood obesity in a new national initiative Let's Move. "We've been struggling with the older kids, ages 6 to 8, who are already way overweight," says Dr. John W. Harrington of Children's Hospital of the King's Daughters in Norfolk, Virginia. "And at that age, it's too difficult to change eating habits." Harrington and his team set out to determine the point at which a child's weight gain becomes unhealthy and leads to overweight. "We backtracked and said, 'When did this weight first happen?'" says Harrington. "Since the age of 3 or 4 months, these children were overweight as babies...they had normal growth but their weights were averaging well above their heights." By identifying when the weight gain first develops, Harrington believes pediatricians will be able to intervene early to change poor eating habits in babies and toddlers on track to becoming overweight. You can call them war games for the 21st century, testing our nation's cyber security like never before. Today, a Washington think-tank is launching a simulated "cyber shockwave" against the United States. An all-star lineup of the country's top security and policy experts are at the ready. Scenarios could include a large-scale failure of the power grid or an attack on something that we can't imagine living without at this point – the cell phone grid. One of the masterminds of it all, former CIA Director Michael Hayden, joined us on Tuesday's American Morning along with one of the participants, our very own national security contributor Fran Townsend, who was a homeland security adviser to President George W. Bush. Program note: CNN has exclusive access to the situation room during today's cyber security drill. You can see all the action as it unfolds in a two-hour special on CNN this Saturday and Sunday from 8 to 10 p.m. ET. Nearly 800,000 Americans will have a stroke this year. And of those, 1 in 12 will have another stroke soon after. So how do you protect yourself? We paged our Dr. Sanjay Gupta for some answers. He joined us on Tuesday's American Morning. Editor’s Note: In this week’s American Morning original series “The Gun Trail,” we are taking a look at how legal guns could get into the wrong hands. Today, our Ed Lavandera is on the front line – a state at the start of the so-called iron pipeline – a pipeline that could end in your streets. Tomorrow, we go from the front line to the end of the line – the city streets. Are laws at the local level making it harder for the criminals or the legal and responsible gun owners? CNN's Ed Lavandera looks at both sides of the ''lost or stolen'' weapons law in the fight against gun trafficking. Kayton Smith says you'd be surprised the stories gun buyers reveal. "What made you decide to buy a firearm?" he asks a potential customer. "Do you want to know the truth?" the customer asks. You are about to hear the kind of story that puts Kayton Smith on edge. "I left New York owing someone a lot of money and eventually they’re going to find me. Better safe than sorry," the customer tells Smith. The buyer is a legal Russian immigrant. After calling the FBI's instant background check system, the sale is put on hold while the Feds look deeper into his background. 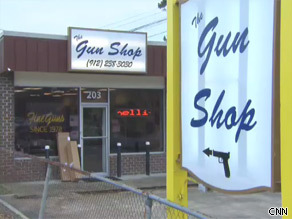 Smith and Ricky Duffy run The Gun Shop in Savannah, Georgia. We spent a day with them, watching dozens of customers come through The Gun Shop. According to federal statistics, Georgia is the number one state for exported guns used in crimes across the country. Gun safety advocates say that has created what is known as "the iron pipeline" of illegal guns flowing north, from places like Savannah, Georgia into northeastern states with stricter gun laws.